Peekaboo premium WordPress theme is a delightfully bright and cheerful child oriented template that is designed to be engaging for that adorable little rascal in your life. 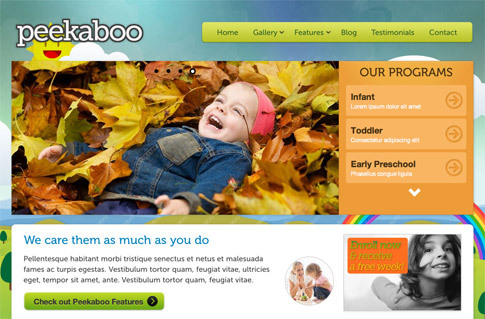 Peekaboo premium theme is designed to work well for daycare, preschool, and other small business owners geared towards the kiddos. You’ll certainly enjoy the large homepage slider and lightbox feature so that you can easily display photos for your visitors to see what your kids are up to at school! Check out Peekaboo premium WordPress theme at the end of the post. Come back and check out the showcase as we find more sites from around the web using Peekaboo.